Hi everyone! Welcome to Day 1 of the Winterhaven Collection Blog Hop! You should have arrived here from Ardyth's blog. The complete list is below if you get lost along the way. The collection goes up for sale on Tuesday, October 10th at 9am to those on the Wait List and then ordering will be open to the public, if the collection hasn't sold out already, at 6pm. The box contains products that can be used together to create many different cards. They can also be used along with products you already have in your stash! Awesome!! I have had a blast creating with this collection. My first card features the Here We Come A-Caroling stamp set. I absolutely LOVE the silhouette images that come in this set. They look amazing stamped over blended backgrounds like I did here. See the dog, that is Catherine's dog Eli! So cute!!! There is also an adorable squirrel in the set that I have to use soon on a card. Also, check out the font on that sentiment! SWOON!!! There are many other sentiments in this set with the same font. LOVE!!! ***There are a couple ADD-ON die sets for this collection. When ordering your box you can add these to your cart as well. My second card features another sentiment from Here We Come A-Caroling, the Ornamental Background stamp, Good Stuff stamp set & dies. I love that the dies in the Good Stuff die set can be used not only to create amazing tags, but can be used them to create a fun frame for your cards. Also, the Ornamental Background is amazing stamped on a full card base, but also fun to fussy cut and use individual ones like I did here. AND another amazing sentiment. I love this collection and will have more cards to share with you soon. Its time not to start hopping along, BUT before you go, make sure you leave comments on each stop along the way for your chance to win! Your next stop on the hop is Justine! One winner will be chosen at random from EACH day's comments and announced on October 11th on Catherine's blog. The winners will win their box and if you have already purchased it, you will be issued a Gift Certificate worth $100 towards a future purchase. Love them both!!!! SO much, simply perfect! Love how you used the background stamp yo make ornaments! Nice color choices! Such lovely cards! I especially love the silhouettes, too! What lovely cards today . Thank u for sharing! Love the Carolers and your color choices! Very pretty holiday cards! I like the non-traditional colors for the season. These cards are so Holiday cute!!! I can't wait to get this SOA. These cards are beautiful. Gorgeous cards my friend!! The blended colors on the first one are so beautiful for a Christmas card. Great cards. Love the Carole's and dog. Love both of these cards but especially the carolers! Love your cards. Thanks very much for sharing. Love the carolers and the colors you chose. What stunning cards. I adore the carolers!!! Oh wow, a silhouette stamp! Loving it! Beautiful cards, Kristie! They are wonderful! You are so talented! I cant wait to get my hands on the silhouette. I have so many ideas! I really like your cards, the favorite being the one with the silhouette of the carolers. Very classy! I love, love the simplicity of both cards, all the while they are art pieces for sure. Gorgeous! Thank you so much for the inspirations. Such amazing cards! Can't get my eyes off them. Such simple designs...yet so beautiful! Love them both! It's time to CASE the carolers! Gorgeous cards the colors are awesome thanks for sharing. Love both cards. I love what you did with those carilers! That for just pops! I love both of your cards! Fantastic ! Great cards! Those silhouette Carole's are amazing. Kristie, love the pink background with the silhouettes! Great cards! I love your little ornaments! Lovely cards! I especially like the All is Calm card! Beautiful choice of colors on both cards. Oh my goodness! Those carolers are so amazingly beautiful. Well done. Kristie, your cards are always so good! I really love the first one with that background! I love these gorgeous cards. Thanks for sharing. I love both cards, Kristie! I love what you did with the ornaments! Gorgeous! I love the non-traditional holiday colors! I really love the singing carolers. Of course having Catherine's dog is really cute also. I look forward to his SOA. Thank you for your creative cards. I can tell that the background stamp is going to invaluable! Love your cards! For some magical reason the silhouettes on your card really reflect the calm that is in the air. That's what I enjoy about Christmas. You never fail to make me smile at your creativity, plus a gift to me....I learn a lot from you. Thanks. I love the pink sky with those sweet little carolers. They have stolen my heart. Love all the new things! Thanks for sharing. Great cards, Kristie! The carolers are so cool! Lovely background colours and technique. Both cards are beauties! I especially love the black silhouetted choral group against the blended background. Super cute idea using the tag as a frame for hanging the fussy cut ornaments of the background stamp. So much inspiration here. So cute! I especially love your first card with the color blocking and black images. So lovely! Loving this SOA box. Both cards are CAS perfection, Kristie. Great cards! Love that there is a dog silhouette! And love that the tag dies can be used as a frame. Hi, Kristie! 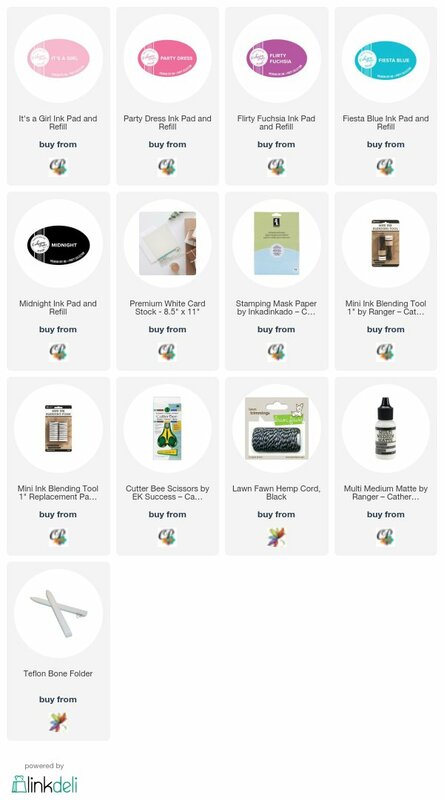 Since your blog post comes to my email box and I do email first, I started my hopping here - and what a fabulous start! I especially love your second card - colors, layout, everything. When I first saw the background stamp I wondered if the design could be cut apart, and now I know. Yay! Beautiful cards Kristie! So bright & cheerful, love them! Your cards are always so pretty, Kristie! Beautiful job. This collection is awesome. Lovely cards. Can't wait to get these stamps! Gorgeous cards Kristie. I love the first one with the silhouette images stamped over the pretty blended background. Love the pink background with the silhouettes. You are spot on. Oh I just love them both! Beautiful cards, I can't wait for this collection. My first thought was not to order this box. But your cards have changed my mind. My birthday is this month, so I decided "why not treat myself?" Wonderful cards. I especially like the Carolers and the silhouettes. Especially the added touch of the dog. You have 2 stunners here Kristie! I love the pink sunset with your carolers - so beautiful! Great use of the frame die too! Hugs to you! Lovely cards. Thanks so much for all the beautiful inspiration! Kristie- your cards are so beautifully classic! Thanks so much for the frame idea- that sent me spinning off to idea land times ten!! Both cards are amazing, but I knew they would be! I love the silhouettes, too. And how you cut the ornaments from the larger background stamp - perfect! Love the silhouette. Like the idea of you ornaments from the background Stamp. I really like your cards. So pretty! Both cards are beautiful but those silhouette carolers are amazing. Both of your cards are lovely, Kristie! Love those silhouettes! I really love the carolers AND the ornaments. These will be really fun to play with! Thanks for the inspiration, Kristie! Love that bright pop of pink behind the caroler silhouettes. Unconventional and lovely!! Cant wait to play with this collection. Love those vibrant colors for the holidays. The silhouettes are beautiful and I love the colors used on the ornaments. Thank you for sharing. Kristie I love the colors you used for these amazing Christmas Cards. Your cards are so cute! I love that you did the lovely pink background for the carolers! I love the little ornament too! 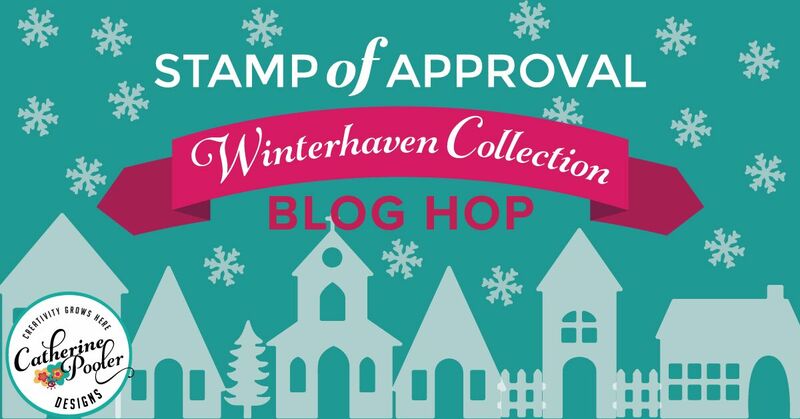 What can I say - Winterhaven is going to be hit just like all the other Stamp of Approval Boxes! Thanks for sharing your creativity! Pretty cards and beautiful ink blending! Wow! Both of those cards make me have warm fuzzys just looking at them. They are amazing! Great simple cards that would be easy to mass produce. WOW! awesome card. Love the color. Just when you think the collections can't get more amazing....Catherine does it again! Love your cards, great job! Great cards!!! I must admit that although the first is very vibrant and has great coloring, I love the second one more. Regardless will be trying to recreate both cards for sure. Thanks for sharing! Silhouette against the blended background is just OMG fantastic! Your cards are always beautiful including these two. So elegant, so clean, and sooooo amazing. Love love love the second card! Well done! I just love those carolers! Simple and elegant. beautiful cards you are so talented. Fantastic clean and simple cards that really pack a punch! Well done! These are both great! 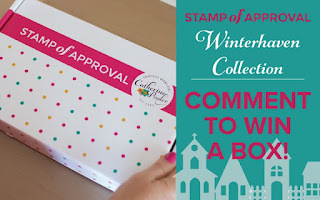 Love the stamps and the colors you used! Your cards are beautiful! I love those silhouettes against the bold background. Love these cards! The silhouette card is my favorite. Your style is just so gorgeous. I love looking at your cards! Kristie, just love both cards. I really like the one with the carolers best! Love the ornament with the twine. So many creations! I love the ornaments with the baker's twine. But I have to admit the pink background to the carolers is beautiful!! Love them. I love your cards especially the colors you used. Can't wait until Monday night! Such wonderful cards....love the silhouette images. Love the pink background with the carolers. Just wonderful! So excited for this collection. Love your cards. Beautiful cards, excited about this collection. I especially love your card with the pink and purple background with the crisp edges and the sentiment bridging into the white area and the silhouettes. So pretty. Cool idea to make a frame! The silhouettes look so good on your gorgeous background! So so pretty! Happy World CardMaking Day! Such beautiful creations! That color block card is wowza! I love your cards and especially this collection. My favorite time of the year! Kristie, I love your cards. What a fabulous box of Christmas joy this SOA appears to be. I love the sayings on your cards. Your cards are beautiful. Love this new collection. Great cards! Love the colors you used. Both cards are great, but the first is my favorite. I love the colors and the carolers. I always love your beautiful cards, Kristie! You have a keen eye for classy looks. Great color combos on both cards! Clean and simple designs but so elegant! Loving your beautiful cards! Especially the ornament card. That little dog is so cute! Love both of your creations. Both very creative and super colors. Simple and elegant, as always, Kristie. I love your cards! Love your use of the background stamp pieces. That pink sky is stunning. I love it with the carolers. Beautiful holiday cards! I love the black silhouettes on the pretty pink-purple sky and the bright ornaments are so festive on the other card. Love your projects, so fun and festive! Gorgeous card! I LOVE the pink background behind the shadowed carolers. And OMG, the dog is over the top! Great ideas. Your right, there are so many different things to do with this set. I like your first card best. That background looks great with the silhouettes on it. I love how clean and fresh your cards are! Those silhouettes are going to be a favorite of mine, I'm sure, along with that ornamentals background! Thanks for sharing your beautiful cards! Kristie, these cards are amazing, so in love with what you have done with the collection of stamps and dies! I love the carolers and the use of color for the cards. great cards. I wouldn't have thought of those colors for the background on the carolers but it's stunning. And the simplicity of the white frame on the next card is perfect! Your cards are AMAZING, Kristie! I love how cleverly you used the Ornamental Background to create the ornaments on your second card. Brilliant!! So beautiful ❤️ The box is amazing! The cards seem simple at first glance but the details you put in, are absolutely gorgeous! I like the carolers. I am from Cambridge, OH and we have Dickens characters on our main street and the scene reminds me of our town. I can't wait to play with those silohettes!!! 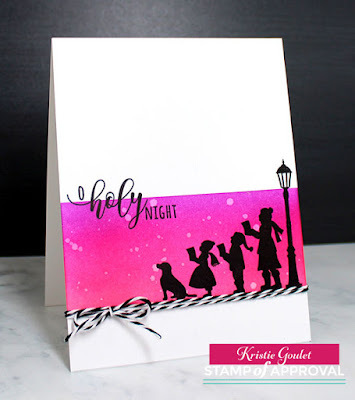 `I love those silhouettes in the carolling stamp set. Easy and elegant look to the card. The ornaments on the second card are gorgeous! I love the silhouettes too! Absolutely love this collection, can't wait. Your ideas are wonderful. Wonderful cards. My fave is the caroling card. Both of your cards are beautiful, Kristie! Those silhouettes are so great!! Beautiful! I usually don't do traditional but these stamps give you all kinds of ideas. the entire family is fantastic. Great cards. Colors are beautiful. I love your cards!!! They're beautiful! Excited to get the Caroler silhouette! I really like the crisp look of your cards! Love your use of none-traditional Christmas colors! I love your cards and that silhouette design is amazing! Thanks for sharing on this great blog hop!! I always did love a silhouette scene! OMG I love the silhouette on the blended background. Love that it's not traditional Christmas colours. Can see this card being cased for Christmas! Great cards and oh so beautiful!! Gorgeous cards and fabulous colour choices too! I like both cards! The caroling one is so nice and captures my eye. I can't wait to get this set! I like that you can make a frame as well as a tag! Fantastic cards! The silhouettes against the pink background is stunning!! The Christmas carolers card is just so cute! I can't wait to CAS-it! Nicely done, always love these ideas. Loved your carolers because I am a singer and the ornaments because they are so retro. Great cards all the way around! Love the cards you created using the Winterhaven stamp kit. I love both your cards! Simply beautiful. Kristie, thank you for sharing your cards!! I love them both! Nice job! No surprise here that I love your cards! I don’t think I’ve seen a card from you that I didn’t like :) I love your CAS style and how the colors you choose always look so crisp. Love the pink background on the first card and those ornaments on the second one are fantastic! Love the clean design of these cards and the fun way you used the tag dies on the ornament card!